21 December 2018 was a big day for ColFeroX, a start-up supported by the Horizon 2020 project REGROUND. 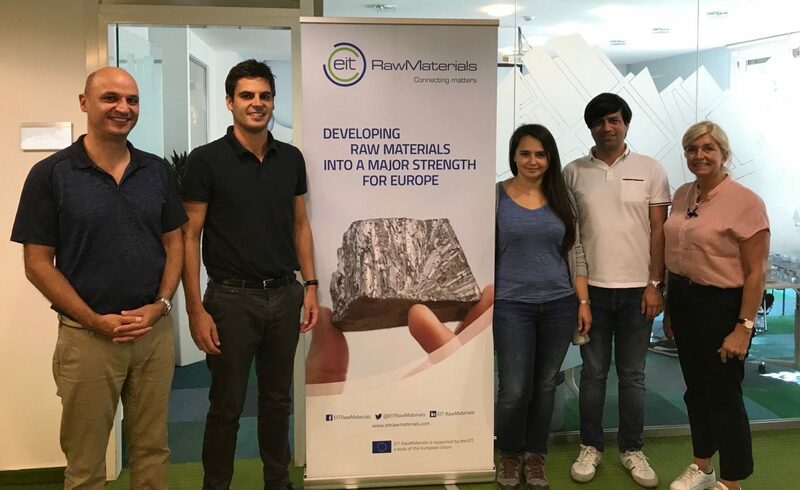 Two of the start-up founders, Dr Beate Krok and Dr Sadjad Mohammadian from the Faculty of Chemistry of the University of Duisburg-Essen (Germany) graduated successfully from the EIT RawMaterials Accelerator – Phase 1. ColFeroX benefited from a collaboration between EASME (the European Executive Agency for SMEs) and EIT RawMaterials aimed to support impactful and innovative entrepreneurs. When presenting their business idea during the EASME Investors café in Brussels on 12 June 2018 Beate and Sadjad were selected by EIT RawMaterials to participate in the first edition of its RawMaterials Accelerator (Phase 1). During three months, the entrepreneurs worked hard on strengthening and validating their business offering specifically targeting the Raw Materials sector. They were guided through the entrepreneurial journey by Business Development Managers from EIT RawMaterials. Not only could Beate and Sadjad learn the basics of entrepreneurship via the participation in bootcamps and training sessions, they were also challenged along the way via individual coaching sessions. The last step was to deliver a complete pitch in front of a Jury of expert which Beate and Sadjad did successfully. ColFeroX offers highly innovative in-situ remediation of heavy metal contaminated groundwater using colloidal iron oxide nanoparticles. Due to their unique properties, these particles can be injected into aquifers where they cover the surface of the sediment and thus form a permeable barrier to groundwater. This barrier stops the spread of heavy metals. The ColFeroX remediation procedure is more cost-effective than ex-situ measures, can be implemented within a few days without incurring running costs, and can be used on active industrial sites with very low constructional measures. Thanks to the EIT RawMaterials Accelerator program, ColFeroX further matured its business model and customer understanding and is now significantly closer to market uptake. Thanks to EIT RawMaterials and EASME we had fruitful three months in terms of learning the basics of entrepreneurship. We have learned how to build and adjust our short- and long-term plans based on the market, and more importantly how to speak to costumers and learn more about them and their values rather than only promoting ourselves and our product. In addition, we are grateful that the EIT RawMaterials Accelerator program introduced us to a new network of companies, startups, and coaches, with whom we can expand our technology into raw materials and mining sectors. This year was the first edition of our EIT RawMaterials Accelerator program. We want to thank the selected start-ups for their enthusiasm and for their tremendous effort and commitment during the last three months. We are convinced about the potential offered by the ColFeroX technology in the mining and Raw Materials sector. It is a real pleasure supporting them in their journey towards market introduction. ColFeroX is also a great example of how different European innovation bodies (EASME, EIT RawMaterials) can efficiently support European innovators and entrepreneurs. REGROUND is one of the first innovation projects kick-started under Horizon 2020 back in 2014. It aimed at demonstrating promising water innovations at larger scale and bringing them closer to the market. This is a great example of how combining EU grants and acceleration services in a synergetic way can help European innovators to strengthen even further their innovation capacity, entrepreneurship skills and therefore to achieve greater market impact. The overall objective of the EIT RawMaterials Accelerator program is to increase the success rate of market entry by scalable Start-ups, focusing on addressing market risk. The Accelerator program comprises three phases. Each phase has specific objectives, process, funding and timeline. The support provided follows a clear process, which consists of both group work, individual coaching as well as anchoring Start-ups in their local and national ecosystems while at the same time opening up to the pan-European level thanks to the EIT RawMaterials consortium of partners and stakeholders. This unique combination of local anchoring and Pan- European opportunities largely increase the success rate and market opportunities of the selected Start-ups.